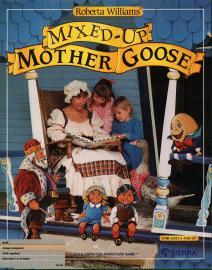 Mixed-Up Mother Goose is a children's game where nursery rhymes are mixed up and Mother Goose needs your help to fix them. The game was originally released in 1987 with the AGI engine, but was later remade with the more capable SCI engine in 1990. In 1991, the game was remade again with better graphics, voices, and an improved interface. The original AGI version and both SCI remakes of Mixed-Up Mother Goose are now supported by ScummVM, a program designed to let 2D adventure games run on multiple platforms. With ScummVM, Mixed-Up Mother Goose now runs on modern versions of windows, as well as Linux, Mac OS X, and many consoles such as Dreamcast, Wii, PlayStation 2, and PlayStation Portable. For a complete list of platforms supported by ScummVM, see here.